Situé à proximité de nombreux cafés, restaurants, boutiques et hôtels. À seulement quelques minutes à pied des tramways et de la jetée animée. Beach House à proximité (pour le grand enfant en vous ou pour vos propres enfants). Parc à proximité. Beaucoup de beaux sentiers de randonnée avec la mer à vos côtés. Appartement autonome avec des ustensiles de cuisine, de la vaisselle, etc. Écoutez les mouettes et les dauphins ne seront pas loin. Regardez les bateaux qui vont et viennent .Smettez l'air de la mer en cuisinant le dîner ou en dégustant un verre de vin. Sèche-cheveux, lave-linge, sèche-linge fourni. Toilette séparée. Grand bac, pas de bain. Les heures d’arrivée et de départ peuvent être flexibles si pré-arrangées. Thé, café, sucre, lait, pain, margarine, vegemite, papier toilette, gratuit à l'arrivée. What a wonderful stay. The apartment is exactly as advertised. Clean, comfortable, spacious and the location can’t be beat. We spent our mornings on the balcony and days on the beach. Close to the free tram to the CBD and walking distance to restaurants and shops. Maureen was super gracious and helpful. Will definitely stay again when in the area! Glad you had a lovely stay . Thankyou so much for taking the time to write a review. Just as advertised. Modern property, well maintained. Nice views of marina and coast towards north. Owner very friendly and cooperative. Good parking and access. A bit noisy on weekend from street and restaurants but did not detract from our stay. Thankyou Bob for taking time to write this review.Glad the dolphins paid you a visit too . Great apartment with magnificent views.! The Apartment was magnificent. Everything about it from cleanliness to use of facilities supplied for our stay, to the views from the apartment were first class. We would definitely stay there again. Thank you Maureen for giving us an opportunity to experience it and for being a wonderful person to deal with. thankyou for leaving the apartment so clean and tidy .Hope to see you again . Perfect location, sensational views, beautiful apartmemt with everything you need. We wished we could have stayed longer! The apartment was in the perfect location only steps away from the beach, cafes, restaurants, park, The Beachouse and shops. The views from the balcony were beautiful, our daughter loved sitting out there watching the boats come in and out. 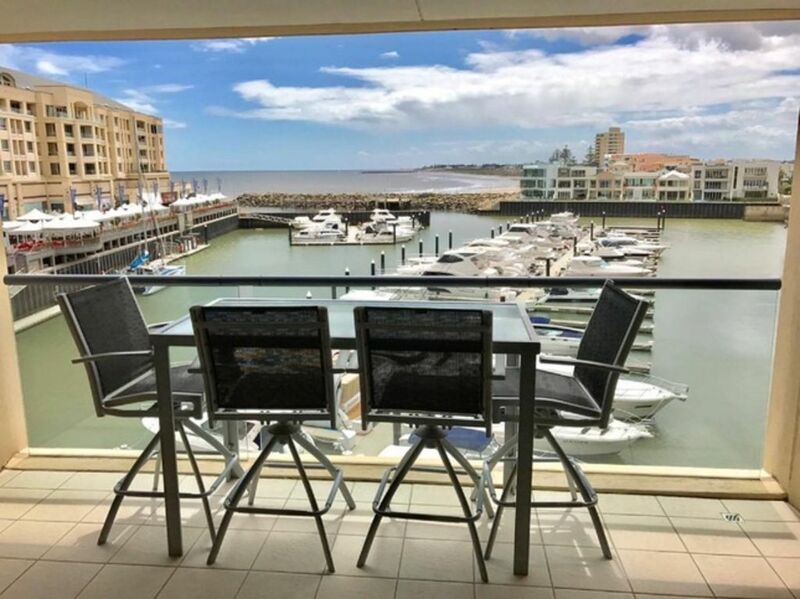 The apartment has absolutely everything you need which means that some nights we stayed in and prepared our own dinner and enjoyed our views. Maureen was extremely helpful meeting us there to welcome us and show us around. Thank you Maureen, we would highly recommend your apartment and would certainly return. Thankyou Megan for taking the time to write this review. I hope to see you again next year . A lovely, bright, clean apartment with balcony and views. It has everything you need and the owner happily settled us in and provided breakfast ingredients. Very comfortable. Had a lovely stay! Thankyou Gerry for taking the time to write a review. Glad you enjoyed your stay . We loved our stay, Maureen is excellent to deal with very accomodating and highly recommend.